Do MBT Shoes Fight Cellulite? Recently I heard about an anti cellulite shoe. Yes! At first, I thought it was a joke but after doing some research, I realized it wasn't. The MBT shoe is designed by a Swiss engineer to stimulate barefoot walking or running. He was inspired by the Masai people of East Africa who walk barefoot over miles on uneven terrain. The fascinating fact about these people is their alleged experience of few back and joint problems. As a result, MBT shoes were designed to turn a flat surface into an uneven one. So how does this benefit people today? But are these claims true and most importantly are MBT shoes an effective cellulite treatment? There have been some studies conducted to test the alleged benefits of MBT shoes. Research at the University of Calgary found the MBT shoes cause less stress on knees and hips than regular shoes. Another small study by Swiss researchers concluded a greater use of calf, quad, and shin muscles in MBT wearers; they believe the shoes may help strengthen muscles in the lower leg. But what about cellulite? Despite the big buzz that the MBT reduces cellulite, there is little or no published data to back these claims. Most evidence is largely derived from testimonials. Are MBT shoes worth it? As a cellulite solution, MBT shoes are probably not your best bet. They cost over $200 and they're ugly -- they resemble orthopedic shoes. For a shoe with no proven record in fighting cellulite, I say this is a hefty price to pay. You'll also experience a rocking motion when you wear them. For some, this may cause dizziness and risk of falling. Initially, you may experience aches and pains as your body adjusts walking in these shoes. Because there is some evidence that this shoe can increase foot strength and flexibility; it can be a good investment for athletes. However, the shoe is not for everyone; not all people benefit from barefoot walking. 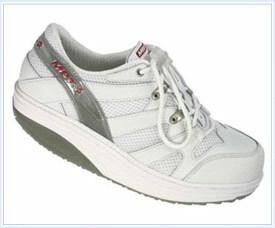 People who have diabetes or circulation problems to the feet should not wear MBT shoes. I say rather than invest in these shoes, try going barefoot more often at home, at the beach or even your office. And as far as a cellulite treatment, opt for an on the spot anti-cellulite product, endermologie, or mesotherapy.